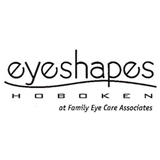 Eyeshapes Hoboken (Hoboken) - Book Appointment Online! We have over 20 years experience serving Hoboken with the highest level of eye care. We use the latest technology including computer assisted eye exams to ensure accuracy, and the newest diagnostic equipment to assess, diagnose and treat eye disease. The Doctors and staff at Eyeshapes Hoboken are friendly and knowledgeable. Our optical boutique carries great frame collections from, Christian Dior, Juicy Couture, Gucci, Coach, Jimmy Choo, Calvin Klein, Tom Ford, Giorgio Armani, Kate Spade, Nike, and Maui Jim. We also carry a large selection of children's eyewear and the latest fashion sunglasses. If you are a contact lens wearer, we carry Acuvue Oasys and 1 Day , Air Optix, Bausch&Lomb, Biofinity , Dailies, Light&Clear, Purevision, Sauflon, and most other soft and RGP lenses including astigmatism and bifocals. Outstanding! The staff and doctors never disappoint. My exams were very thorough even though I was 30 mins late for my appointment and they were all very patient, courteous and helpful. Dr. Kansky is a very professional doctor, she examines every item in detail and explains insurance coverage clearly. Highly recommend it!